In this lightweight Eye Serum by Kahina Giving Beauty, a unique combination of natural ingredients, including saccharomyces cerevisiae and rhodiola root, work together to provide a feeling of superb antioxidant protection, and give skin a strengthened and stimulated feel. All while reducing the appearance of puffiness and dark circles. Superpower ingredients sodium hyaluronate and plant peptides boost a look of youthfulness, and provide the appearance of smooth, moisturized skin. You’ll see the difference. This ultra-lightweight, non-greasy serum delivers a feeling of deep hydration, improved circulation and antioxidant protection around the eye. Ideal for day, night and in-between, its infusion of botanicals makes this little black bottle a must-have for reducing the appearance of under-eye puffiness and dark circles. A little goes a long way with this natural eye serum for dark circles and puffiness. Dispense a half-pump on pinkie or ring finger and tap to spread to the other. Pat gently around the eyes working from the bridge of the nose out and up to the eyebrows. 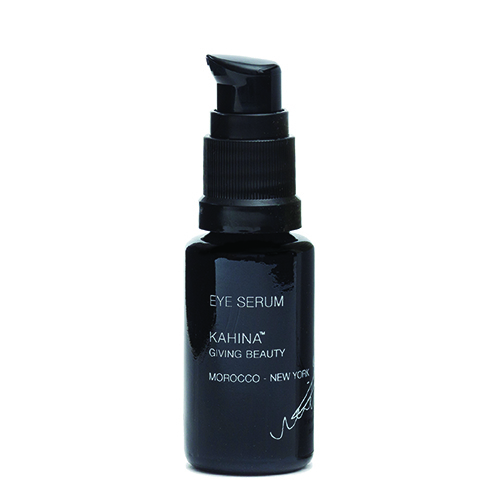 This Kahina Giving Beauty eye serum is a travel essential, especially on overnight flights. Just before your plane lands, pat serum onto the bone just under the eye for about a minute to improve the appearance of circulation and puffiness. Apply any extra to the upper lip area; the peptides and sodium hyaluronate help improve the look and feel of this delicate skin.